Prof. Collar holding one of the early CoGeNT germanium detector prototypes. The small central contact, responsible for the modest electronic noise in these devices, is visible. 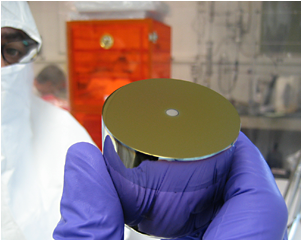 The CoGeNT experiment looks for a type of dark-matter particle called a WIMP, or Weakly Interacting Massive Particle, specifically those relatively light in mass. Recent data obtained at the Soudan Underground Laboratory present an excess of events that might be compatible with WIMPs in the mass range of 7-11 billion electronvolts. Several phenomenologies predict such dark matter candidates, which might also be behind a long-standing claim for dark matter detection by the DAMA/LIBRA group. Our investigation of this exciting possibility continues with the planned upgrade of the CoGeNT detector mass to an array comprising 5.2 kg of germanium crystals, in collaboration with Pacific Northwest National Laboratory (PNNL). PhD Thesis Defense, Bjorn Scholz, "First Observation of Coherent Elastic Neutrino-Nucleus Scattering"
PhD Thesis Defense, Nicole Fields, "CosI: Development of a Low Threshold Detector for the Observation of Coherent Elastic Neutrino-Nucleus Scattering"
PhD Thesis Defense, Christopher Kelso: "Recent Results in Dark Matter Direct Detection Experiments"
PhD Thesis Defense, Phil Barbeau, "Neutrino and astroparticle physics with P-type point contact high purity germanium detectors"